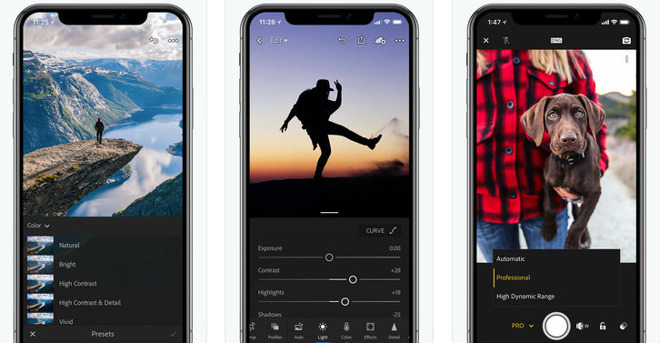 Released to the App Store on Friday, the iPhone version of Adobe Lightroom CC adds support for the camera on the iPhone XS and iPhone XR, making the app work better for images taken on Apple's 2018 iPhones. Arriving at the same time, Adobe Lightroom CC for iPad introduces full support for the 2018 iPad Pro line, including both the 12.9-inch and 11-inch models. The iPad version also works with the refreshed Apple Pencil and its new gesture system, with a double-tap gesture allowing users to switch between paint and erase modes with certain tools. Along with the device support added in both versions of the app, the updates also mention the addition of customary "bugfixes and stability improvements." Adobe offers Lightroom CC as a free app, though to turn on all features, it requires an in-app subscription priced at $4.99 per month, or $9.99 per month if users wish to have 1 terabyte of cloud storage. While the updates for Lightroom CC are more for compatibility than adding major new features, Adobe has promised it will be bringing a version of Photoshop CC to iPad in 2019, a release that will likely be welcomed by image editors who have longed for the full editing tool to be brought to Apple's tablet range.